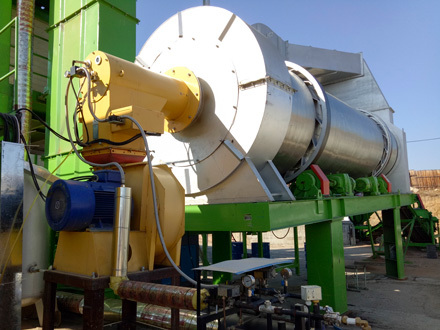 Drying drum is one of the core components of asphalt mixing plant, it use heat coming from the burner to heat cold aggregate containing water through heat exchange, it is aggregate dehydration, heating system components. 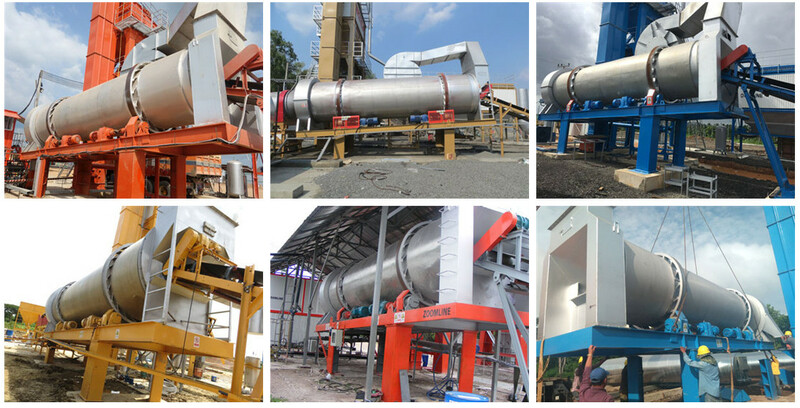 The performance of drying drum directly determine the production of a complete set of asphalt mixing plant, the quality of finished product, the reliability of a complete set of asphalt mixing plant. The core parameter of drying drum is the heat exchange efficiency, it influence production of drying drum and equipment operation costs. 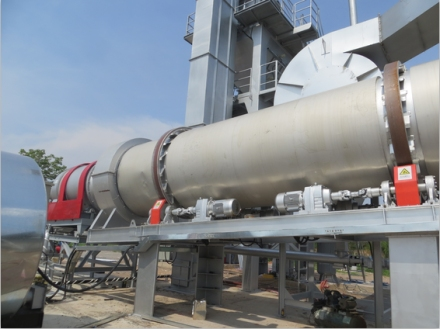 Therefore, our company constantly improve the heat exchange efficiency of the drying drum, saves the energy consumption to a great extent for the customer to reduce customer’s use-cost. We provide fixed and movable type drying drum for choose. Core factors affecting the thermal efficiency of the drying drum is whether the drum can form complete and uniform material curtain. And the formation of material curtain is decided by the material blade’s structure and layout inside the drum. So design and layout of dry drum blade is a key element to affect the thermal efficiency of the drying cylinder. Drying drum blade layout is generally consists of four areas that feed area, material curtain area, radioactive zone, discharge area. The increase of thermal efficiency stand for lower energy consumption, namely reduce operating costs. Therefore, improving the drying drum thermal efficiency is very necessary. To improve the thermal efficiency and reduce energy consumption, the following aspects should be mainly considered. 1. Reduce the moisture content of cold aggregate. 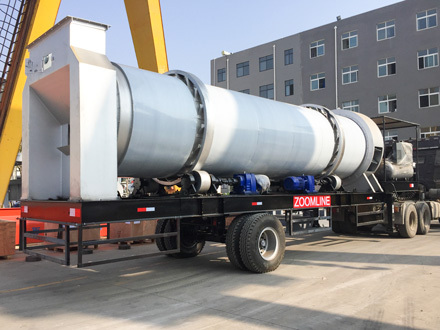 Practice proved that the aggregate moisture content is the main factor that influences the production of drying drum, so trying to reduce the aggregate moisture content is the effective method to improve the quality of asphalt mixing station, reduces the operation cost. 2. 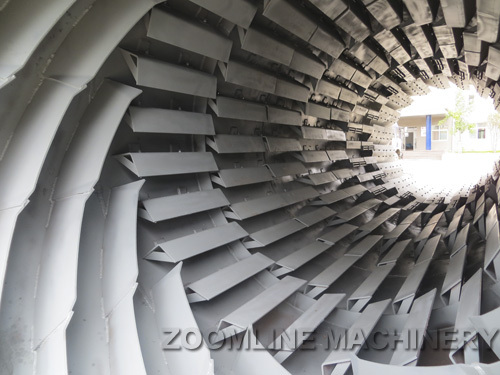 Reasonable design of drying drum internal material blade. Our material blade consists of L (obtuse, acute angle), T, and Z type and so on. After continuous exploration and practice, our drum thermal efficiency reached to the first-class level. 3. The choice of combustion engine. Company select the world famous brands combustion engine as supporting facilities, powerful guarantee the fuel combustion efficiency. 4. Seal of drying cylinder. Good sealing effectively reduce the ingress of external cold air, the cif drying drum sealing, high temperature zone use non-contact labyrinth seal, lossless element, greatly enhance the reliability of equipment operation, reduce the operation cost; low temperature feed end adopt combination of mechanical seal and labyrinth seal. 5. Draught (draft) system. 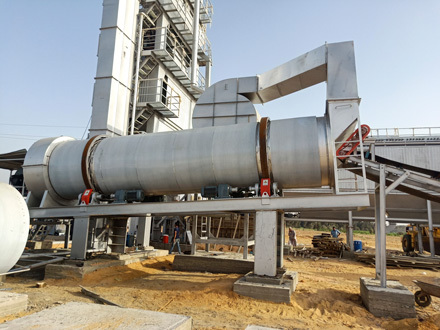 Our asphalt mixing plant, damper of draught system is equipped with electric control (as the following picture), according to the change of aggregate feeding conditions, real-time adjust through air of drying drum. In order to achieve the best match of air flow, fuel consumption and heat.